Researchers from Vanderbilt University in Tennessee developed a new technology that has the potential to revolutionizing the way we store energy. By creating the first useable supercapacitor made out of silicon they created a tiny unit that can store energy for mobile devices which can charge in seconds and not hours as well as solar cells that can deliver electricity 24/7. Supercapacitor have been seen the holy grail of power storage for years, however their energy density and other factors left them operating in only a few niche markets so far including regenerative braking systems (on buses and electric vehicles) and providing the bursts of power required to adjust of the blades of giant wind turbines . The team started from porous silicon – a material with a controllable and well-defined nanostructure made by electrochemically etching the surface of a silicon wafer (a process which is part of the manufacturing process of chips and solar cells). typically silicon is not considered a good candidate for creating supercapacitors since it reacts with some of chemicals in the electrolytes. In order to solve this problem Pint and his team decided to try and cover the silicon with an ultra thin layer of graphene coating. Pint and his team already had some experience in growing carbon nanostructures so they decided to try to coat the silicon surface with carbon. According to Pint: “We had no idea what would happen. Typically, researchers grow graphene from silicon-carbide materials at temperatures in excess of 1400 degrees Celsius. But at lower temperatures – 600 to 700 degrees Celsius – we certainly didn’t expect graphene-like material growth”. However this is exactly what happened – when they looked at the newly created material under a scanning electron microscope they discovered that it looked nearly identical to the original material but it was coated by a nono layer of graphene. The team discovered that the graphene coating improved the energy density of the silicon supercapacitor by over two orders of magnitude compared to those made from uncoated silicon and significantly better than existing commercial supercapacitors. 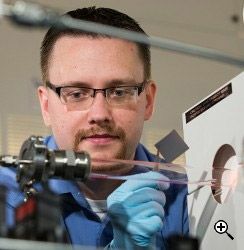 Pint and his team are currently trying to develop their technology to store energy on the unused back sides of solar cells and sensors. In this way each cell can store energy by day and release it by night when there is no sun. You can find more information on this new development on the University in Tennessee website. TFOT covered many supercapacitor related developments over the years including a T-shirt with a built in supercapacitor that can charge your smartphone developed by researchers at the University of South Carolina as well as a supercapacitor technology developed by a 18-year-old student from Lynbrook High School in California.